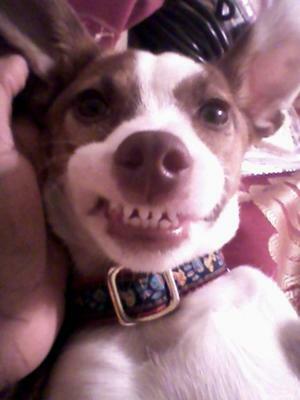 Sydeny is a Jack Russell Terrier as you can see and she is a fun loving dog! She loves people. When she sees one she get all hyper and want to play. She is a very smart dog. She knows right from wrong. She likes to play with other dogs but some times she s scares them away. One time our neighbor had a big dog and when I took sydeny out to use the restroom she saw our neighbor's dog and jumped on him. The dog was so scared of her that she made him pee by their door step. It was so funny! Anyways she is a loving dog and im glad to have a JRT!